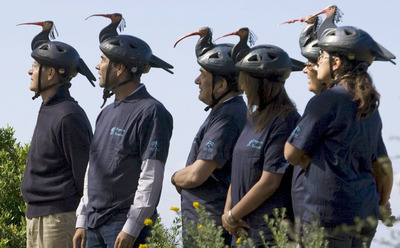 Bizarre photo of the month goes to the people involved in the bald ibis reintroduction programme, who released six birds this week in the Sierra de Retín (Cádiz), making a total of 24 so far this year, and 215 since the proyecto Eremita began. El País. Note: the hats, in addition to an essential fashion item this summer in Cadiz, are part of the plot to confuse the birds that they have been raised by ibises not humans. The aim is to reintroduce the bird to areas where it has become extinct and to strengthen existing wild populations in North Africa. The last definite reference to the bald ibis breeding in Spain is from a 15th century falcony book. I’m pleased to announce the first iberianatureforum sponsored wildlife project. The plan is to support the conservation of the endangered Southern Midwife toad (Alytes dickhilleni – above photo from sierradebaza.org.) The idea has arisen from a visit members of the forum made last month to the Zoo Botanico in Jerez de la Frontera, the best in Spain in terms of conservation of local species, and has been organised by joint forum-owner Clive whom I quote here. The zoo is in the process or requesting permission to collect from the wild an endangered species of amphibian for captive breeding and release and we (The Forum) can help out with the project. Alytes dickhilleni is a species of Midwife toad that only occurs in the Southern part of Spain hence its common name of “Betic / Southern Midwife Toad” after the “Baetic” mountain range in the Andalucía. (In Spanish it’s a Sapo partero bético). The community of iberianature has come a long way over the last year or so and we have all contributed to an excellent resource about the natural world of Iberia but this, for me at least, is an excellent opportunity for us as a group to help in a practical way some people who are really working hard to protect their environment. If you like iberianature and you would like to contribute to this project please send me or Clive an email. UPDATE: Pregnancy turned out to be phantom.